Roberto Cofresí y Ramírez de Arellano [nb 1] (June 17, 1791 – March 29, 1825), better known as El Pirata Cofresí, was a pirate from Puerto Rico. Despite his birth into a noble family, the political and economic difficulties faced by the island as a colony of the Spanish Empire during the late 18th and early 19th centuries meant that his household was poor. Cofresí worked at sea from an early age; although this familiarized him with the region's geography, it provided only a modest salary. He eventually decided to abandon a sailor's life, becoming a pirate. Despite previous links to land-based criminal activities, the reason for Cofresí's change of vocation is unknown; historians speculate that he may have worked as a privateer aboard El Scipión, a ship owned by one of his cousins. At the height of his career, he evaded capture by vessels from Spain, Gran Colombia, the United Kingdom of Great Britain and Ireland, Denmark, France, and the United States. Cofresí commanded several small-draft vessels, the best known a fast six-gun sloop named Anne, and demonstrated a preference for speed and maneuverability over firepower. He manned them with small, rotating crews, which most contemporary documents and accounts numbered at 10 to 20 in size. Cofresí preferred to outrun his pursuers but his flotilla engaged the West Indies Squadron twice, attacking the schooners USS Grampus and USS Beagle. Although most crew members were recruited locally, men from the other Antilles, Central America and expatriate Europeans occasionally joined the pirates. Despite never confessing to a murder, he reportedly boasted about his crimes; the number of people who died as a result of his pillaging ranged from 300 to 400, mostly foreigners. Cofresí proved too much for local authorities who, unable to contain him themselves, accepted international help to capture the pirate; Spain created an alliance with the West Indies Squadron and the Danish government of Saint Thomas. On March 5, 1825, the alliance set a trap which forced Anne into a naval battle. After 45 minutes, Cofresí abandoned his ship and escaped overland; he was recognized by a local resident, who ambushed and injured him. Cofresí was captured and imprisoned, making a last unsuccessful attempt to escape by trying to bribe an official with part of a hidden stash. The pirates were sent to San Juan, Puerto Rico, where a brief military tribunal found them guilty and sentenced them to death. On March 29, 1825, Cofresí and most of his crew were executed by firing squad. The pirate inspired stories and myths after his death, most emphasizing a Robin Hood-like "steal from the rich, give to the poor" philosophy which became associated with him. In poetry and oral tradition this portrayal has evolved into legend, commonly accepted as fact in Puerto Rico and throughout the West Indies. A subset of these claims that Cofresí became part of the Puerto Rican independence movement and other secessionist initiatives, including Simón Bolívar's campaign against Spain. Historic and mythical accounts of his life have inspired songs, poems, plays, books and films. In Puerto Rico caves, beaches and other alleged hideouts or locations of buried treasure have been named after Cofresí, and a resort town near Puerto Plata in the Dominican Republic is named for him. 2 "Last of the West India pirates"
"Last of the West India pirates"
The timing of this decision was crucial in establishing him as the dominant Caribbean pirate of the era. Cofresí began his new career in early 1823, filling a role vacant in the Spanish Main since the death of Jean Lafitte, and was the last major target of West Indies anti-piracy operations. While piracy was heavily monitored and most pirates were rarely successful, Cofresí was confirmed to have plundered at least eight vessels and has been credited with over 70 captures. Unlike his predecessors, Cofresí is not known to have imposed a pirate code on his crew; his leadership was enhanced by an audacious personality, a trait acknowledged even by his pursuers. 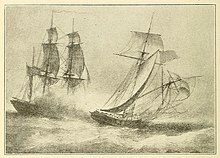 According to 19th-century reports he had a rule of engagement that when a vessel was captured, only those willing to join his crew were permitted to live. Cofresí's influence extended to a large number of civil informants and associates, forming a network which took 14 years after his death to fully dismantle. Continuing to drift, Cofresí and his crew were captured after his ship reached Santo Domingo. Sentenced to six years in prison, they were sent to a keep named Torre del Homenaje. Cofresí and his men escaped, were recaptured and again imprisoned. The group escaped again, breaking the locks on their cell doors and climbing down the prison walls on a stormy night on a rope made from their clothing. With Cofresí were two other inmates: a man known as Portalatín and Manuel Reyes Paz, former boatswain of El Scipión. After reaching the province of San Pedro de Macorís, the pirates bought a ship. They sailed from Hispaniola in late September to Naguabo, where Portalatín disembarked. From there they went to the island of Vieques, where they set up another hideout and regrouped. Guayama mayor Francisco Brenes doubled his patrol. Salovi was soon arrested, and informed on his shipmates. Hernández Morales led another sloop, intercepting Beagle off Vieques. After a battle, the pirate sloop was captured and Hernández Morales was transported to St. Thomas for trial. After being sentenced to death, he escaped from prison and disappeared for years. According to a St. Thomas resident, on February 12, 1825 the pirates retaliated by setting fire to a town on the island. That week, Neptune captured a Danish schooner belonging to W. Furniss (a company based in Saint Thomas) off the Ponce coast with a load of imported merchandise. After the assault, Cofresí and his crew abandoned the ship at sea. Later seen floating with broken masts, it was presumed lost. Some time later Cofresí and his crew boarded another ship owned by the company near Guayama, again plundering and abandoning her. Like its predecessor, it was seen near Caja de Muertos (Dead Man's Chest) before disappearing. According to several of the pirates' death certificates, they were buried on the shore next to the Santa María Magdalena de Pazzis Cemetery. Hernández Morales and several of his associates received the same treatment. Cofresí and his men were buried behind the cemetery, on what is now a lush green hill overlooking the cemetery wall. Contrary to local lore, they were not buried in Old San Juan Cemetery (Cementerio Antiguo de San Juan); their execution as criminals made them ineligible for burial in the Catholic cemetery. A letter from Sloat to United States Secretary of the Navy Samuel L. Southard implied that at least some of the pirates were intended to be "beheaded and quartered, and their parts sent to all the small ports around the island to be exhibited". Spanish authorities continued to arrest Cofresí associates until 1839. ^ Despite having an etymology based on pilot boat, the term "pailebot" is used in Spanish to describe a small schooner. ^ The Spanish referred to the vessel as the Princesa Buena Sofia. ^ Anne is frequently referred to as a schooner. ^ a b Gladys Nieves Ramírez (2007-07-28). "Vive el debate de si el corsario era delincuente o benefactor" (in Spanish). El Nuevo Día. Retrieved 2013-11-10. ^ Cabo Rojo: datos históricos, económicos, culturales y turísticos. Municipio Autónomo de Cabo Rojo. n.d. p. 15. ^ a b c "Isla de Mona: guarida del Pirata Cofresí" (in Spanish). La Perla del Sur. 2012-06-27. Retrieved 2013-11-10. ^ Antonio Heredia (2013-06-24). "Viceministro de Educación dictará conferencia en PP; pondrá en circulación libro" (in Spanish). Puerto Plata Digital. Retrieved 2013-11-11. ^ a b c d e f g h Eugenio Astol (1936-05-09). El contendor de los gobernadores (in Spanish). Puerto Rico Ilustrado. ^ a b c Freeman Hunt (1846). "Naval and Mercantile Biography". Hunt's Merchants' Magazine. Retrieved 2015-04-21. ^ a b c d e f g h i j k Luis Ascencio Camacho (2013). "Singularidades y posibles irregularidades en el juicio de Roberto Cofresí" (in Spanish). Academia.edu. Retrieved 2013-10-08. ^ "Spanish Colonial History". National Museum of American History. c. 2000. Archived from the original on 2001-10-30. Retrieved 2013-12-02. ^ a b c d e "¿Qué pasó hoy?" (in Spanish). NotiCel. 2012-07-01. Retrieved 2013-11-04. ^ "Parroquía de Cabo Rojo" (in Spanish). MayaWest Magazine. 2012. Retrieved 2013-11-13. ^ Luis González. "Inicios del Correo Aereo en el Caribe y Puerto Rico". Sociedad Filatélica de Puerto Rico (Philatelic Society of Puerto Rico). Archived from the original on 2013-12-15. Retrieved 2013-12-14. ^ Hijacking of U.S. Planes Began with Seizure at Marathon May 1. St. Petersburg (FL) Times. 1961-08-04. pp. 16-A. ^ "El pirata Roberto Cofresí Mi ley, la fuerza del viento o algo así. Mi única patria, la mar. ¿Otro ponche ron? Vale" (in Spanish). El Periódico de Catalunya. 1995-07-19. Retrieved 2015-05-01. ^ "Jüdische Piraten in der Karibik: Mit Kippa und Totenkopfflagge" (in German). Die Tageszeitung. 2009-04-29. Retrieved 2016-06-27. ^ Nelson Mattos Filho (2015-09-06). "Os piratas" (in Portuguese). Tribuna do Norte. Retrieved 2016-06-27. Acosta, Ursula (1987). New Voices of Old- Five centuries of Puerto Rican Cultural History. Permanent Press. ISBN 0915393204. Acosta, Ursula (1991). Cofresí y Ducoudray: Hombres al margen de la historia. Editorial Edil. ISBN 9780317616286. Cardona Bonet, Walter A. (1991). El Marinero, Bandolero, Pirata y Contrabandista Roberto Cofresí (1819–1825). Sociedad Puertorriqueña de Genealogía. ISBN 9781933545059. Clammer, Paul; Grosberg, Michael; Porup, Jens (2008). Dominican Republic & Haiti. Ediz. Inglese. Lonely Planet. ISBN 978174104292-4. Fernández Valledor, Roberto (1978). El mito de Cofresí en la narrativa antillana. Publisher: Editorial Universitaria, Universidad de Puerto Rico. ISBN 0847705560. Fernández Valledor, Roberto (2006). Cofresí: El pirata Cofresí mitificado por la tradición oral puertorriqueña. Casa Paoli. ISBN 0847705560. Ojeda Reyes, Félix (2001). El Desterrado de París: Biografía del Dr. Ramón Emeterio Betances (1827–1898). Ediciones Puerto. ISBN 0942347471. Pariser, Harry S. (1995). Adventure Guide to Dominican Republic. Hunter Publishing, Inc. ISBN 1-55650-277-X. Singer, Gerald (2004). Vieques: A Photographically Illustrated. Sombrero Publishing Company. ISBN 0964122049. José Morales-Dorta (2006). El Morro, testigo inconquistable. Isla Negra Editores. ISBN 1932271791.